For most people the word ‘Enneagram’ (pronounced ‘any-a-gram’) means nothing, yet it has guided our lives since the moment we were born. Whether we have been aware of it or not it has always been there, underpinning our personality and shaping our destiny. Learning about the enneagram is fun and will transform the way your feel about yourself and your world forever. Are you ready to discover your true nature? The Enneagram is the map of consciousness that underpins all aspects of your life. It illuminates the nine ways of being in the world, and gives deep insight into nine fundamentally different personality types, each with their own way of seeing the world, their own attitudes and ways of thinking, reacting and behaving. It is an ancient body of wisdom that holds the key to unlocking true understanding of both ourselves and other people. It reveals the genuine simplicity of life by unravelling the apparent complexities of human beings behaviour in profound ways that modern psychology cannot. When we understand the Enneagram the patterns of our lives finally make sense, we experience profound self-acceptance and clarity of purpose, and discover how to live through positivity and find lasting personal fulfilment. The Enneagram equips us with the tools to bring about profound change within ourselves and our lives, bringing us into balance and giving us the ability to sail over the hurdles in life instead of letting them bring us down. It provides a clear understanding of who we are on a fundamental level and what our intrinsic gifts are, resulting in a rapid increase in self-acceptance, raised self-esteem and greater ability to find new purpose and fulfilment. Our self-defeating patterns of thought and reaction finally make sense - and, more importantly, we discover how to change them. It explains why some relationships flourish whilst others flounder and equips us with the knowledge of how to improve them all. The word Enneagram actually describes a geometric symbol; a universal map that is the key to unlocking the vast and powerful secrets of the Enneagram knowledge. The Enneagram symbol is the symbolic representation of the cycles and patterns of human behaviour. The symbol shows us the process of growth that is held within us, explaining past and present experiences, and even showing where your particular path is headed, and the potential for personal growth in the future. The geometry of the symbol shows lines (energy pathways) that link together nine numbers, which represent nine fundamental ways of being in here in the world. By using the Enneagram symbol the entire landscape of human consciousness can be mapped and charted. For each individual, the three functioning levels of the mind, the conscious, the subconscious and the higher conscious or superconscious can be explained and understood. 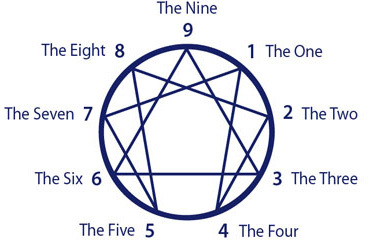 In the Enneagram of Personality, the nine numbers around the circle equate to personality types. Each of the nine types actually sees the world differently, as if through a different ‘filter’. Consequently each type has its own patterns of thinking, feeling and behaving, and each a different motivation or need that drives those patterns. Each of the personalities offers different experience for the Soul in human form. Each number allows the Soul to experience different human qualities, both positive and negative, and provides the Soul with a new and unique opportunity to learn and experience what it is to be human. The Enneagram determines the nature of our basic inner terrain and view of the world when we are born. As we grow up, and start to develop our sense of self - through learning to deal with the world - this driving need develops into what we have come to call personality or ego. Our Enneagram personality type remains the same throughout our lifetime. The change that occurs in our persona as we move through life is the result of growth from the more negative traits of our type back into the positive. In addition to our core personality we are also influenced by traits from four other personality types (called wings & connections). These combine to create our own individual uniqueness. In the past there have been many efforts made to establish the true origins of the Enneagram. Where did it originate? Who ‘invented’ it? Where was it first used? There are common ideas and theories regarding these and other questions, but no definitive answers. Simply put, the Enneagram is not a manmade model created in order to explain certain universal principles; it is the model. It was never invented or devised, but channeled into physical form directly from Source, to help us understand the true nature of our existence. There was never a time when the Enneagram knowledge did not exist since it is intrinsic to all life. In ancient times the wisdom of the Enneagram was taught as an essential part of education and growth. It was entirely accepted as a part of life. At what exact point in history the knowledge was lost is unclear, but aspects of it can be found in the spiritual philosophy of many different traditions, from the teachings of the Sufis to the Jewish Kabbalah. The Enneagram symbol emerged back into public record at the end of the nineteenth century but it was not until the 1950’s that there was once again some understanding of the nine personality types. Since then, many people have sought to fit religious and psychological theory into the Enneagram, which at best, has given only a limited understanding of its wisdom and knowledge, and at worst has been misleading. On the Enneagram Programme only the pure knowledge is taught, undistorted by modern theory, giving depth, insight and balance not offered anywhere else. Through the Enneagram we discover and understand our true selves, and see our negative patterns clearly without self-criticism or ego. This life-changing understanding can then lead us to use our inner gifts to the full, attract and maintain healthy relationships, and lead happier and more fulfilling lives. Knowing whether you are a Type Two, a Type Seven, or whatever, is not the purpose of the Enneagram knowledge. The purpose is to see yourself honestly and clearly, including recognising and acknowledging your most unhealthy traits, how they cause you pain and difficulty and how to let them go. Ultimately the Enneagram is about spiritual growth, and becoming all that you were meant to be. Discovering your personality type is a journey of self-discovery that involves delving into our inner world with honesty, courage and compassion for self.During this process we maybe exposed to truths about ourselves that have never been known before, or we may experience old fears, hurts or anger. Yet it takes courage to go there. If we reject these aspects of ourselves we cannot achieve real growth, and will never discover true happiness and peace. Because of this typing through books or the internet is fraught with pitfalls. We believe the best place to identify your personality type is in a compassionate, healing environment, within which you can begin stripping away the most destructive parts of the personality. The Enneagram Programme provides just such an environment. Veronica Croft, your programme leader, is highly experienced in helping people to understand their personality type clearly, and an essential part of this programme is a Soul freedom Process which involves gently and permanently letting go of the most negative and self-defeating aspects of your type. The effects of embracing the Enneagram as a conscious influence in your life are far-reaching and profound. what matters most to us and why. what we are unconsciously seeking. what causes our relationships to flourish or flounder. what we need to focus on for our personal and spiritual growth. our behaviour and the behaviour of others. how our self-defeating patterns cause us difficulty and pain. our highest qualities and purpose in life.